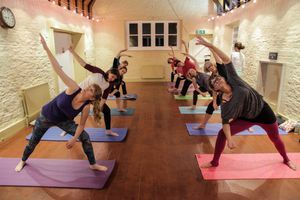 Yoga in the workplace is proven to help improve employee health at work by boosting productivity and energy levels, managing and lowering stress levels, soothing desk bound aches and pains and enhancing employee wellbeing. Yoga & Pilates in schools helps improve childrens' physical health and emotional wellbeing. It is a fantastic form of exercise for those who usually dislike PE, as there is no competition and progress can be seen quickly by the individual. Yoga & Pilates are a simple way to feel better, reduce stress and boost self-esteem. Pick from one of the ideas below or classes can be customised to suit your needs. All mats will be provided. Develop flexibility, co-ordination and balance. Great for team building and bonding. Choose from standard yoga class, partner yoga or a strength and core class. Develop core strength and stamina with a group Pilates class. Reduce tension, stress and anxiety by using meditation, breathing and stress relief techniques to nurture and revive. You will be guided through some warm-up exercises to prepare the body for laughter. The laughter yoga workout will alternate between playful laughter exercises and deep breathing exercises to energise the mind and body. Prices above are per group for Keynsham, Bristol, Bath and Chew Valley area. Other areas may incur the charges below for travel and petrol.